To send remote control commands to a PXS, it must be running an application that supports remote control commands. On a PXS that is running an application that supports remote control commands, the remote control can be enabled or disabled using the control command. To establish communication with a PXS that has remote control enabled, you will need its host name and IP address. These files can have any number of PXS host names and addresses. Select the PXS you want and click OK. Status check of 'pxs-1309671416' successful. Get application data completed: 0 (22 bytes). Get application list completed: 0 (17 bytes). The Application... button is used to send application specific commands to the PXS. When the Application button is pressed, you will be prompted with a list dialog box with the supported commands. Select the command to send and click OK. The Configure button displays a dialog box that shows the applications in the PXS's flash memory, the application options and the application environment variables. These can be changed and saved to the PXS's configuration by clicking OK. The DLM Tap... button displays a dialog box to enable or disable the PXS DLM tap for live data capture. The Status button checks to see if the application on the PXS is running. The Reboot button resets the PXS and immediately loads and runs the default application. The RedBoot button resets the PXS and disables the loading of the default application. The Reset button resets the PXS, and if the timeout is not 0, then after the timeout expires, the default application is loaded and run. Successful remote control operation information will be displayed in the log window. 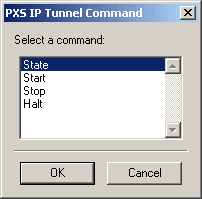 pxscontrol is a command-line interface to remotely control a PXS. It has the same functionality as the GUI version of the program. 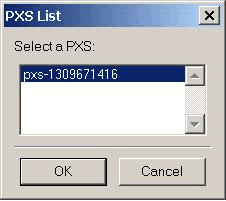 In addition pxscontrol has an option to set a program license in the box. list should be enclosed in quotes. 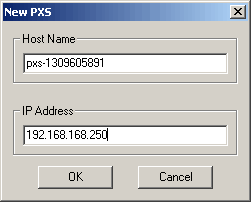 IP address of the PXS. Command from the command set to issue to the running application. format will be supplied by Advanced Relay. Host name of the PXS. Print the command set supported by the running application. Line to apply the -t tap command to. The following command will reset a PXS named x25gateway at ip address 192.168.250.250. After booting, the PXS will remain at the Redboot prompt.